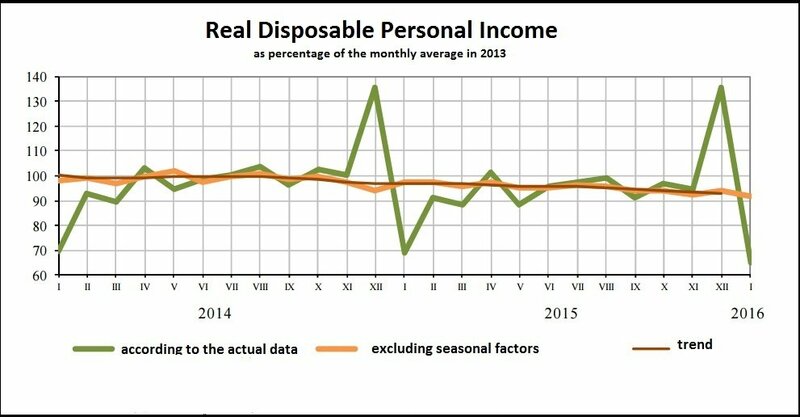 Personal income of Russians shrank by 52.2% in January 2016 as compared to December 2015. 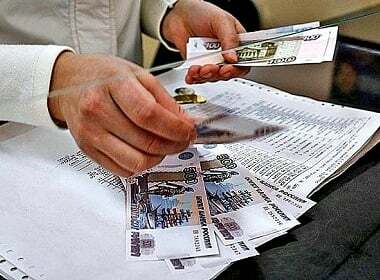 According to the report by the state statistics body Rosstat, the monthly income in January averaged only 21365 rubles (about USD $291) though only a month ago it was 45212 rubles ($614). End of the year bonuses and the long January holidays that limited paydays for contract workers are among the reasons for the sharp drop in the monthly income figures. December numbers are usually 30-35% higher than the average monthly income. January figures traditionally show 30-35% drop as compared with the yearly averages. However, 2016 December-January drop in monthly incomes was sharper than during previous years. Real incomes in Russia decreased by 6.1% over the course of 2015 while the average nominal monthly wage increased by 3.1% to the level of 32122 rubles ($437). Living standards in Russia: average monthly income, real income. Graphics: GKS.ru (click to enlarge). Nominal income is the dollar/ruble amount of income. Simply put, it is the amount of money paid out in cash. Real income is the income of a person after taking into consideration the effects of inflation. It shows how much a person can buy on that amount of money. Theoretically, the amount of nominal income should be regularly adjusted according to the inflation level in the country, so that the person’s purchasing power stays on the same level. Practically, the situation in Russia leaves much to be desired. In 2015 inflation in Russia reached the level of 12-15%. But nominal wages increased only by 3.1%. No wonder that real incomes decreased and keep going down. Moreover, the research holding Romir adhere to the opinion that the official inflation values are way lower than the actual numbers. Experts believe that the actual inflation values could be up to 3 times higher than those showed by the state statistics. Real disposable income in Russia, data by the state statistics body. Graphics: GKS.ru (click to enlarge). The amount of unpaid wages to Russians reached USD $58,8 million as of 1 February 2016. It is 21,3% more than the previous month. Delayed wages are not an unusual thing in Russia, where people receive remuneration monthly, not weekly. Companies explain to the employees that they have no money at the moment and ask them to wait a little longer. Some companies may owe 2-4 month wages to employees. It starts with delaying wages for a week, within a few months it could be a delay for 2-3 months. Instead of getting paid once a month people are getting paid every 5-6 weeks and are being paid their salary from 2-3 months ago. The companies do not pay interest on unpaid wages. It’s not only government employees that suffer from delayed remuneration. 70-80% of players in Russian soccer clubs do not get paid on time, Lenta.ru reported. It’s a country-wide epidemics. For the owners of the companies, delaying wages became another tool to maximize profits. Because the problem is so widespread, people don’t complain, as in another company the situation is just the same. The unemployment rate in Russia is 5,8% for the total economically active population (7,58 million people). While the number is not excessively high, there is a sizable proportion of the population that do not register as unemployed due to miniscule benefits. Russians are becoming increasingly concerned about the economic situation in the country. The research conducted by the Levada Center shows that the majority of people in Russia fear poverty (53%), economic crisis (49%), unemployment (35%). They consider the current economic crisis to be the most important threat to the future of the country. The situation in 2016 strongly differs from the happy outlook of “the fat years” as they are called now, when oil prices were over USD $100/barrel. The years of expansion and development that everyone remembers are in a sharp contrast with today’s contracting economy of Russia. 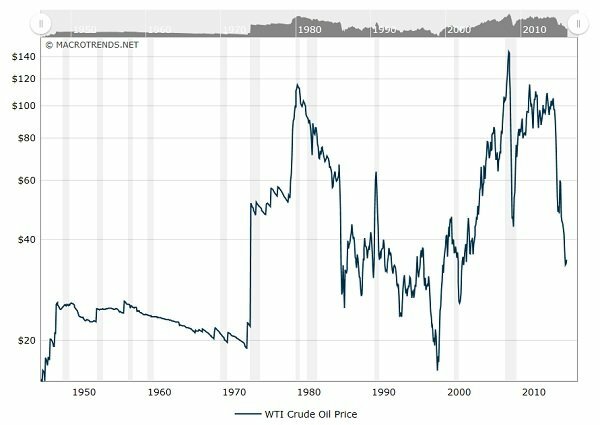 Crude oil price chart 1950-2016. 2008 and 2011-2014 were the years when Russia enjoyed oil prices over $100/barrel. Drop in oil prices sent Russia into an economic crisis. It appears from the chart that this has been a trend for quite a while with $140 being the upper limit of the scale. Between 1940 and 1970, its really grim Is oil Russia’s main export ? Notwithstanding my cheap crystal ball, do you (Elena) have a feel for any improvement ? Please excuse my ignorance…. Thank you. I’m writing to a lady in Chernovtsy. Just trying to get a rough overview of things. I don’t live in Russia, and I suppose neither do you 😉 The government of my country is supportive of Ukraine’s sovereignty. I can read Russian and access statistics, this is what this post is about. Regarding so called “Russian brides”, you may not be aware of the actual situation how it works when people date internationally, it’s very much the same as local dating today. can u plse tell me how much rubles required in simferopol for the famuly of 4 per month. also how much a schoolteacher gets paid per month. What is “required” depends on what you consider a necessity. School teachers in Russia earn less than an average salary. thank u alena, u told me about overall russia..including moscow-st.petsburg.. but what about cremia. how much average per person requires. Nilesh, Crimea is now a part of Russian Federation. So, it’s the same. Where exactly is it said that the average Russian makes $70/month? In Russia salaries are paid (and calculated for statistics) MONTHLY, not weekly or yearly. Average income figures include pensioners and others living on social security payments. All data is from the official source Gks.ru. Look for the article on how wages in Russia changed in 1991-2016 this coming Wednesday 12 October. pshh bread is 3$ here.. for the decent kind..
Elena, I have been writing a doctor-surgeon and she can’t pay to come to the states. How can I know she is not lying and just wants money for herself? I told her from the beginning I don’t have money to send and yet after 2 plus months writing she want over 700 dollars. What do you think about this. I would love to believe her but so many men are scammed and I can`t give it. What do I do? Lenny, it’s a common online dating scam. Don’t send money. Report it to cyber crimes (ask in whose name to send money, the name will belong to the gang member). You were not talking to a real woman, it’s just a set of prewritten mails and photos stolen from the Internet. Real Russian women chat to you on Skype (video), they have Wi-Fi and Internet just like we do. 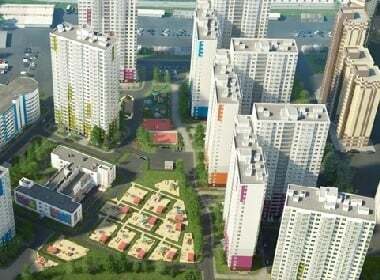 Some Russian pensioners live on 6,000 RUB a month (USD 100), most of them get under $200 a month. how much models and actor make? Billboard ads and shopping commercials. If you are looking for cheap labour, most European companies prefer Ukraine over Russia. For example, Lacoste did their concept ad in Kiev recently. Wages there depend on the talent, but you can find models for as little as $80 per day. In Russia salaries are about 2 times higher. do models earn above average wages in Russia .? my friend seems to be quite ok for funds… so was just wondering . Models in Russia can earn good money, depending on their contracts and the city where they live. Wages in Moscow and St. Petersburg are 3-4 times higher than average, while wages in small regional towns are 2-3 times lower than average. So WTF is Russia so bloody darn expensive for travelers? Russia as a country is not expensive for travelers, but tourist places (especially Moscow and St. Petersburg) can feel pricey for foreigners. Why? Ticket prices for foreigners are much higher than for locals. Russians pay cheaper prices and can enter places of interest free on special days. Branded hotels in Moscow cost the same as in any European capital. Public transport is cheap for both foreigners and locals, but foreigners rarely use it. By the way, the average wage in Moscow and St. Petersburg is also several times higher than country-wide, although most Russians only take home around US$300 a month. How can anyone live on 300.00 per month…..that is only $3,600.00 per year…I understand things are cheaper there?…but still in Russians standard your pretty poor if you make that amount??? Steve, look at the date of this report. The average wages in Russia since had risen, mostly due to the difference in USD-RUB exchange rate. Now it’s around $600/month. But in Ukraine it’s still around $300/month. Besides, pensioners in Russia and Ukraine live on much less. In Moscow, Russia, average wages are around $1000/month. Read more articles here to get the picture. Russia average wage is 600$ lmao, where do you get such numbers, it’s on the par with major ukrainian cities now, Kyiv, Odessa. May be moscow or st.petersburg slightly more, but some cities in russia even make less than people in Odessa or Kyiv. Elena i met a nice russian girl i am paying for her to come here .i am excited and she is too. I hope she comes and i am not catfished . Mark, you are being scammed. Do not send money.